Add garlic and chilli flakes. Sautee until aromatic. Add tomato paste and roast for a minute. Add cherry tomatoes and stir briefly. Add a cup of water and simmer until tomatoes are tender. Add more water if needed. Add spiralized squash. Cook until tender, stirring constantly. 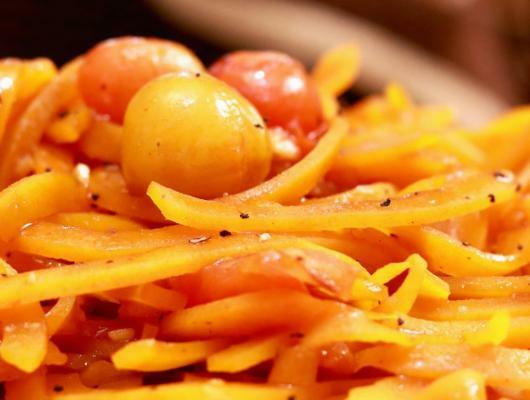 The squash noodles are rich in vitamins, minerals and fibre which make the body healthy. They also have a minimal amount of fat, are rich in protein and are relatively low in calories and carbs. It is a great source of energy for the body—and a great delight to the mouth! That’s also very important. Now, let us see how we can prepare this tempting dish. Shall we!